Brother Nature Produce, a two-acre farm in Detroit’s Corktown neighborhood, has been expanding the availability of fresh, local produce in Detroit since 2009. Brother Nature Produce sells its produce at multiple farmers markets, in Community Supported Agriculture (CSA) shares, and to Detroit restaurants that source food locally. The farm’s founder, Greg Willerer, also established the Downtown Farmer’s Market Detroit. Detroit Dirt is a compost company with a straightforward mission: “To become the engine for the urban farming movement [in Detroit] by regenerating waste into the resources that will reshape” the city. By providing its compost to community gardeners and urban farmers, Detroit Dirt plays a vital role in completing the “circle of life” in food production. FoodLab Detroit is an incubator building a stronger food system for Detroit. Founder Jess Daniels believes that FoodLab is creating a culture within food businesses where companies “can be about more than just profit.” FoodLab helps small food companies grow by making connections and fostering relationships, and takes on big-picture projects that make good food a reality for all Detroiters. The incubator encourages triple bottom-line goals—to protect the environment and generate social value by providing services such as employing youth, healthy food access, and democratically run companies that treat employees fairly in addition to making a profit. The Greening of Detroit’s mission at its 1989 founding was the restoration of tree infrastructure in Detroit. The organization has since expanded and now encompasses a much broader range of urban agriculture endeavors. Today, Greening of Detroit views the abundance of open lots as acreage on which to plant new trees and develop green spaces, prairies, urban farms, and pocket parks. They also use these spaces to provide food education and to create job opportunities for local youth and adult workforce trainees. Hantz Farms Detroit turns “blight into beauty,” transforming vacant and decrepit areas into picturesque, agriculture-ready plots. Founder John Hantz conceived the idea seven years ago, and since then has bought 1,500 city-owned vacant lots. After the removal of trash and blighted structures, trees and food crops now occupy these spaces. Keep Growing Detroit aims to create food sovereignty in Detroit through urban agriculture programs, including Grown in Detroit, a network of family and youth community gardens throughout Detroit; the Garden Resource Program, which provides participants with garden resources such as seeds and Detroit-grown transplants; and The Plum Street Market Garden, which models appropriately scaled, production-focused urban agriculture, trains urban growers and volunteers, and offers hands-on educations sessions. 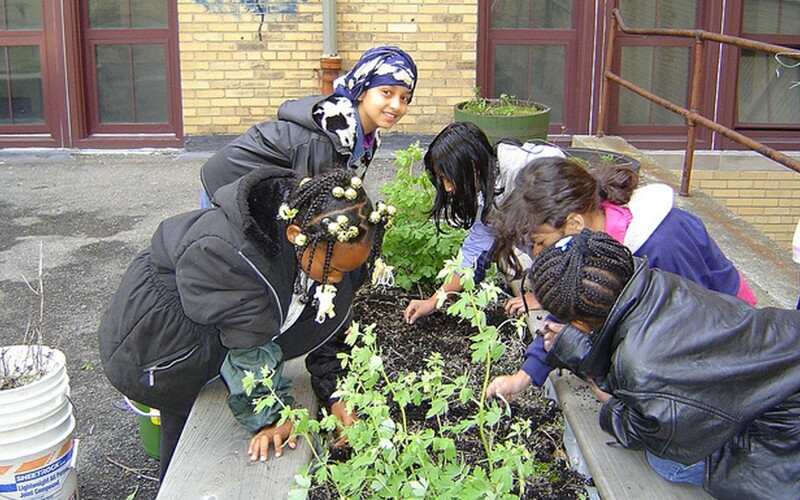 The Michigan Urban Farming Initiative (MUFI) views sustainable urban farming as an educational opportunity and a way to create a food secure society. MUFI engages community members in sustainable urban agriculture and believes that, by fostering positive relationships and creating a tight-knit community at their urban farms, these civic-minded Detroiters can attack some of the city’s biggest problems: vacant lots, unemployment, and lack of access to wholesome foods and nutrition information. Bonnie is a Master of Science candidate in Nutrition and Public Health at Teachers College Columbia University in New York City. She is also currently pursuing her Registered Dietitian certification. After completion of graduate school, Bonnie plans to work in food policy to help create a sustainable food system worldwide.